As a mother of two, I was well-versed in dealing with fevers, but this one was different. My baby girl was not responding to me, at least not like she should have been. So, in fear and desperation, I grabbed my phone and made a call to the pediatrician. They were kind. “Get her in here as soon as you can,” they said. I hung up and dressed, poured a sippy cup for the two-year-old, and pounded out a quick text to a sister in Christ asking for prayer after calling my husband to let him know I was taking our sweet girl to the doctor. Shaken and scared for my baby who didn’t even have the energy to cry anymore, I was both shocked and relieved to see that my worship pastor and his wife had beat me to the pediatrician’s office. Little did I realize that my quick text to a friend had set off a rapid-fire of responses from my church family. My pastor, who had been only a few miles from the hospital where the pediatrician resides, made a U-turn to come and be with me. As he and his wife wrapped their arms around me, I let the tears release, because it wasn’t their arms I felt but the arms of my Savior as the tangible hands of Christ touched me through the Church. I sensed in that hug the whisper of God: I’m here with you, beloved; your daughter is in my grasp. This was the Body of Christ at work. The Church in its finest form. Is the Church perfect? No. And it won’t be until we are in His presence. The Church is made up of undeserving sinners saved by grace, able to live in unity only because of Christ. But the Church is God’s way. It’s God’s design and gift to us as we seek to do this life well. And what’s more, the Church is the Bride of Christ. And what groom doesn’t long for his bride to be adored? At weddings, I love to look at the groom as the bride is walking down the aisle, because the groom is always looking at the bride. There’s no doubting Christ’s love for the Church. Acts 20:28 says Christ obtained the Church through His blood. He died for the Church. Ephesians 5:27 adds that He did this “so that he might present the church to himself in splendor, without spot or wrinkle or any such thing, that she might be holy and without blemish.” Ephesians 5:29 goes on to say Christ “nourishes and cherishes” the Church as a person would their own flesh. Somehow, in some way, Christ makes the Church His own. The Church is God’s chosen avenue to reveal His glory in today’s world. Ephesians 3:20–21 says, “Now to him who is able to do far more abundantly than all that we ask or think, according to the power at work within us, to him be glory in the church and in Christ Jesus throughout all generations, forever and ever. Amen.” Did you catch it? God’s glory is in the Church. Yet when we use that verse to pray, are we asking God to do more than we could ever ask or imagine in our own lives or in and through the Church? Remember, Christ, our Groom, longs for His Bride to be adored. To look for the glory of God apart from the Church is to look for the treasure in every place except the “X” clearly marked on the map. We’ve been told where we’ll see God working—in the Church. We’ve been told how we can be a part of it—by being part of the Church. Christ came that every one of us who believes in Him can be part of the Church. It’s a mystery now revealed, “so that through the church the manifold wisdom of God might now be made known to the rulers and authorities in the heavenly places” (Eph. 3:10). When we place our faith in Christ, something great and wonderful happens. God gives us a place in the Church, the Body of Christ. Every believer is gifted with the special ability to serve the Church. Specifically, the spiritual gifts we gain through the indwelling of the Holy Spirit are for the building up of the Church (1 Cor. 14:12). But when we refuse to take part in God’s design because of fear or busyness or a past hurt we won’t let go of, we miss out on God’s best for us this side of heaven. Hebrews 10:25 encourages us to not give up meeting together in the Church, “as is the habit of some,” especially as we see the Day of the Lord drawing closer. Why? Because living life apart from the Church is like trying to take a bath without water. You won’t be successful. 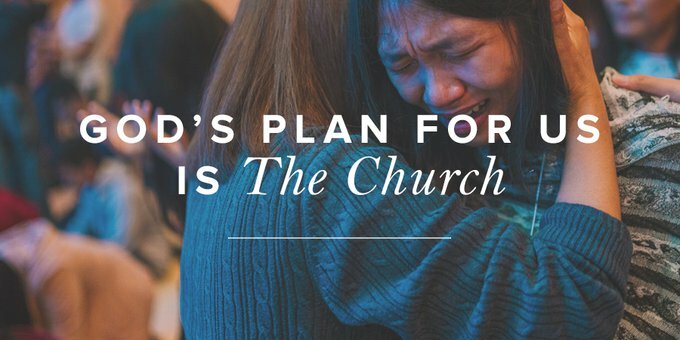 Not when God’s plan for every believer is to live and be and grow in the Church. Sanctification has its deepest roots in the Church. And equipping for the work of ministry is found in the Church because the fullness of Christ is in her (Eph. 4:13). There is joy in serving the Church. There is fulfillment and the blessing of being obedient. There is unity and family and encouragement, but there is also Christ. Because where the Church is, there He is also: “For where two or three are gathered in my name, there am I among them” (Matt. 18:20). So being part of the local church is to experience Christ as He intends us to. The hands and feet of Jesus are known and experienced by way of the Church. I admit, at times I’ve been critical of her. I’ve set up boundaries and kept my distance, fearful of what might happen if I didn’t. And I missed out. Can God work through us individually? Yes, of course. But there is abundant blessing in allowing His glory to shine through us corporately. Jesus said the world will know the love of God through the unity of His people (John 17:23), but we as believers will know it, too, as Jesus calls us, equips us, and unites us in the Church. Revealing Himself to us through the love of His life, His beloved Bride, the Church.